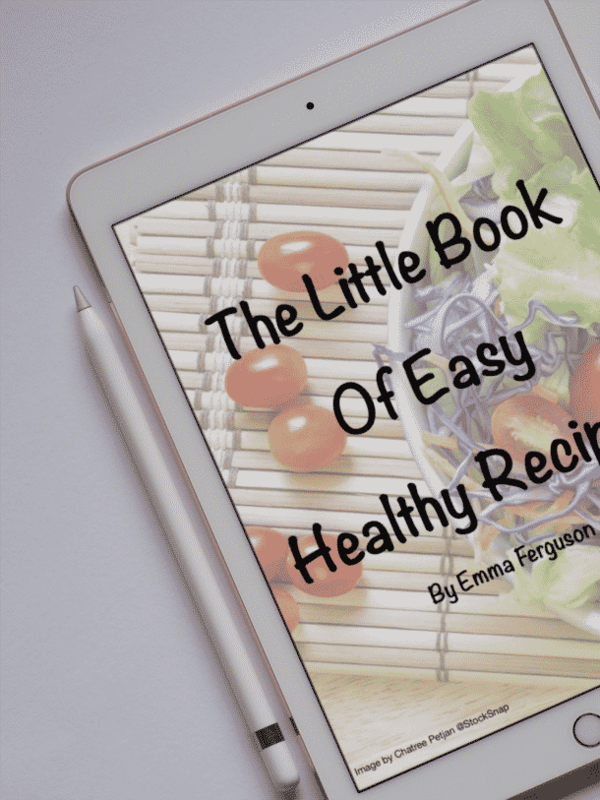 So why do I love this recipe so much? Well it’s easy and it’s all prepared the night before and the fridge then does all the hard work for you. Then all you have to do is pop it in the oven in the morning and allow the oven to warm it up and bake it through. Heaven on a plate. 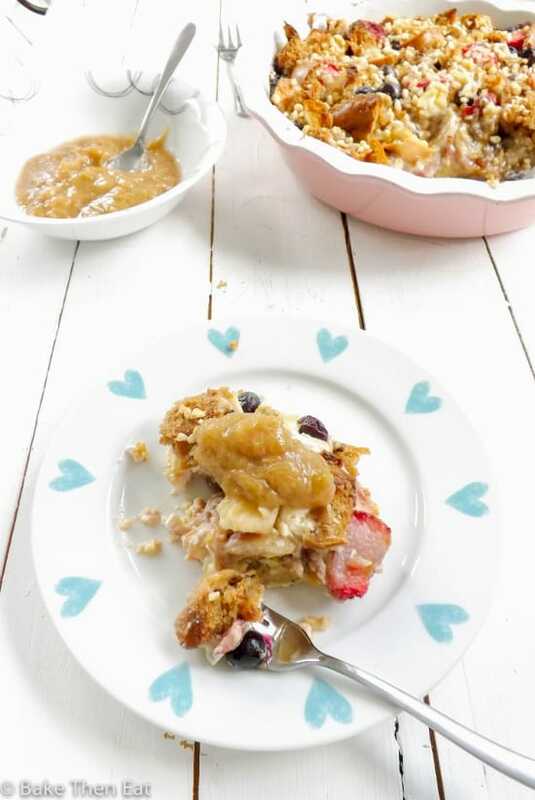 Kelly has done, banana, strawberry and blueberry versions of this bake. While all looked amazing I had a load of leftover fruits loafing in my fridge and decided to throw them all into the mix. I also served mine with a little rhubarb compote. This is completely optional but highly recommended. As the tartness of the rhubarb cuts through the sweetness of the other fruits and the rich creamy custard. Let’s talk a little about the custard for a bit. It’s thick, rich and creamy and It’s packed full of cream, milk, eggs a cheeky bit of pure maple syrup and a dash of lovely vanilla. 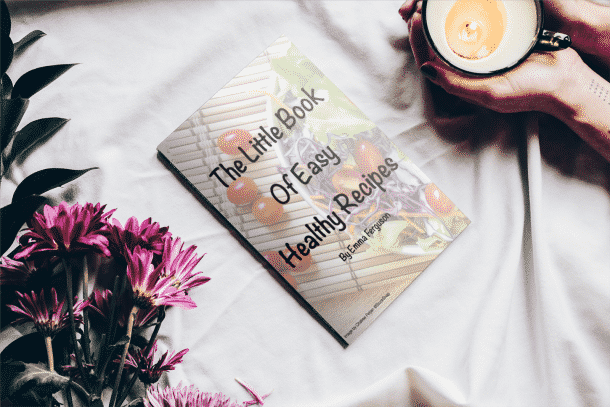 It’s super easy to make, you whisk everything up in a jug and pour it over everything and allow it to soak in overnight. I have talked before about being a lover of bagels. But where I live they come in packs of 6 and Michael is not much of a fan. And sometimes they can start to go a little stale before I have managed to get through the packet. I HATE waste and always try to repurpose everything. 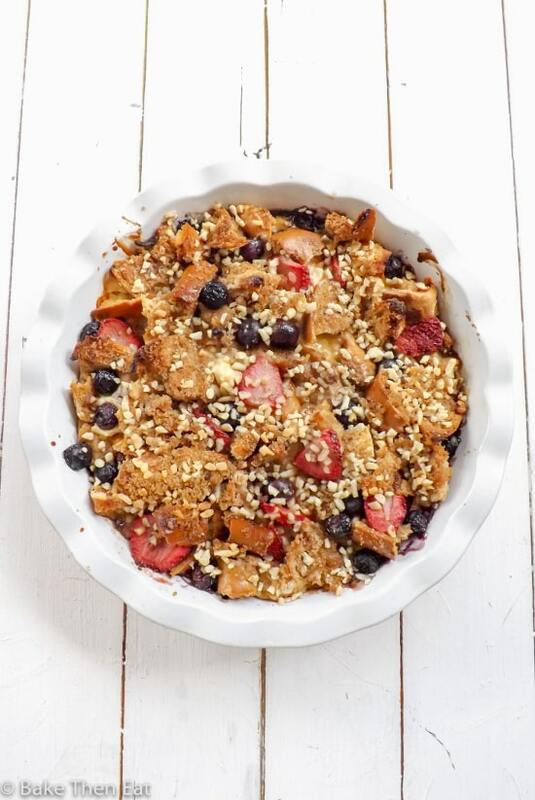 Hence why this French toast bake is made with leftover bagels. That was the inspiration behind this French Toast Bagel recipe and the idea to use bagels in this dish instead of the more commonly used French bread. But by all means, use French bread if you want to. I sprinkled some chopped mixed nuts and some brown sugar on top to give it a little crunch on top. But if you are avoiding refined sugars or don’t like nuts then, by all means, leave the topping off. 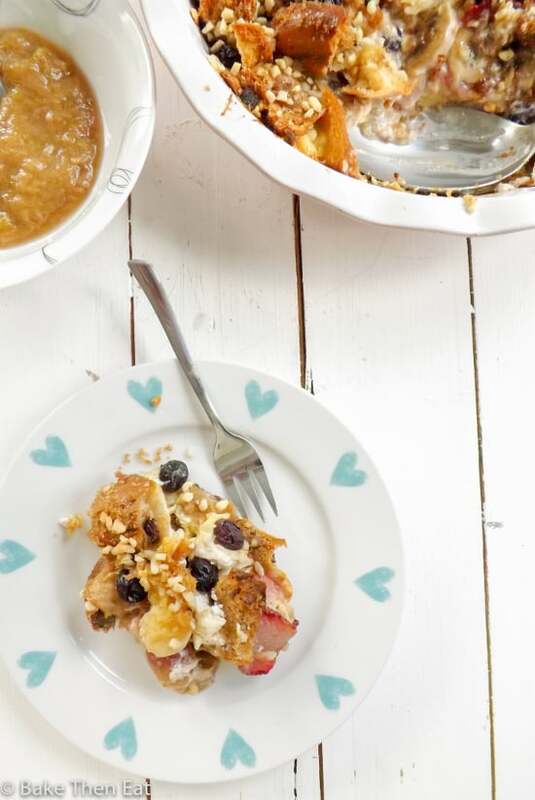 So enjoy this lovely Easy Overnight Cream Cheese French Toast Bake. Let the fridge and oven do all the work for you while you relax with your morning coffee. 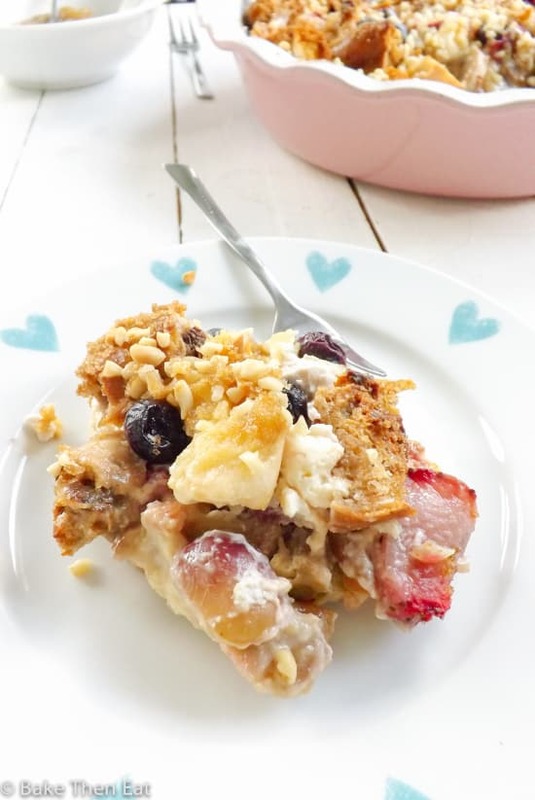 An Easy Overnight Cream Cheese French Toast Bake, packed full of strawberries, raspberries, grapes, banana, blueberries and a rich custard poured over bagel chunks. Lightly grease a 9 inch square or round dish. Arrange half of the bagel chunks in the bottom of the dish. 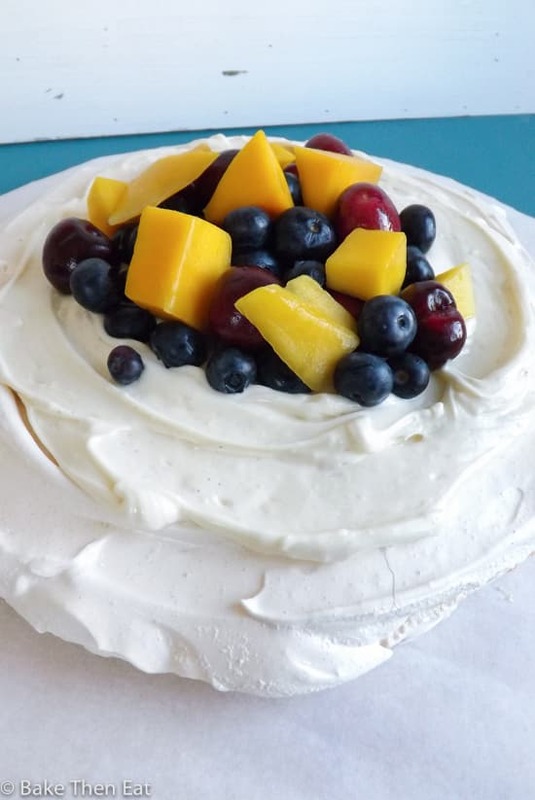 Layer the cream cheese cubes over the bread and then layer half of your fruit on top of the cream cheese. Top with the remaining bagel cubes. In a large jug lightly whisk together the cream, milk, eggs, maple syrup and vanilla extract together until they are well combined. Pour all the liquid evenly over the bagel cubes. Gently press the cubes down so they can fully absorb all the custard mixture. Top with the remaining fruit. Sprinkle the chopped nuts and brown sugar evenly over the top. Cover the dish with foil and place it in the fridge overnight or a minimum of 6 hours. In the morning remove your pan from the fridge and heat your oven to 180C / 350F / Gas mark 4. Once your oven is up to temperature place the pan into your oven with the foil still on for 30 minutes. After the 30 minutes remove the foil and bake for a further 25 to 30 minutes until it is crisp and golden on top. Take it out of the oven once ready and allow to cool for 5 minutes before serving and enjoying. If you wish to make the rhubarb compote I recommend making it the night before when you are making the bake. Place everything in a small pan and gently heat until the rhubarb starts to break down and the compote thickens slightly. This will take about 10 minutes. Then allow to fully cool down to room temperature and place in the fridge till needed. The compote will keep, covered in the fridge for up to 3 days. 1. Place any uneaten bake back in the fridge once it is at room temperature, covered and reheat at the same temperature for 15 minutes covered with foil.2. Eat within 24 hours. 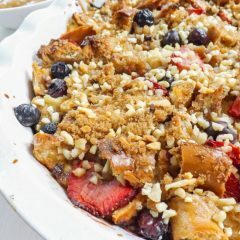 I love make ahead breakfast recipes and this French toast looks terrific! Plus the rhubarb compote is a delicious touch!!! I love my breakfast loaded with fruits. 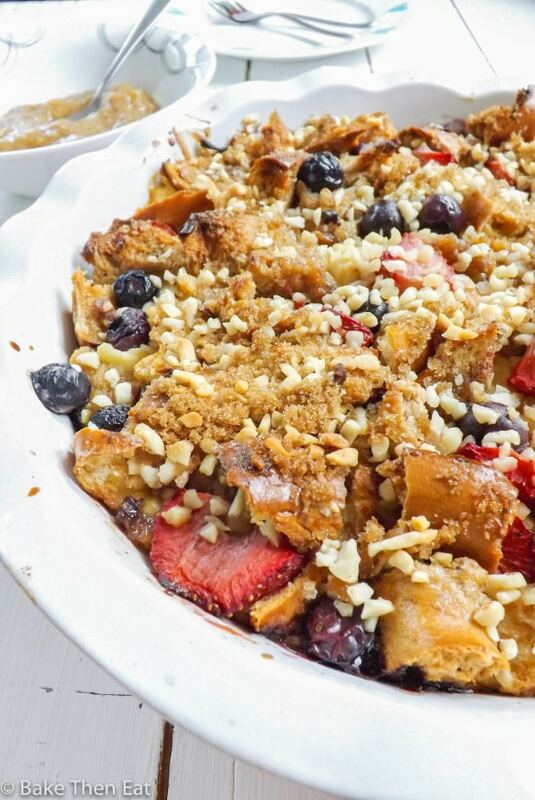 This overnight bake looks so very delicious, Emma. Aaaw yay! This looks gorgeous, Emma! Breakfast is my favorite and I love all the all the fruit you piled in here with the bagels! It sounds absolutely perfect! Hi Kelly, thank you for the inspiration for this dish 😀 I loved it! Hi Sarah, thank you. Breakfast is seriously becoming my favourite meal of the day! 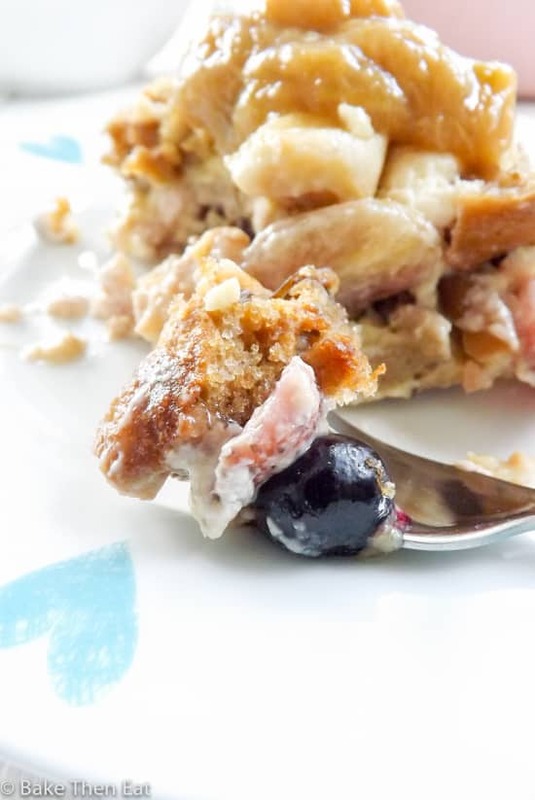 I love the idea of using leftovers to create a new recipe, and I don’t think it’s ever possible to go wrong with cream cheese! I could definitely go for a breakfast like this one! Hi Brianna, thank you 😀 I love repurposing leftovers to make new dishes.